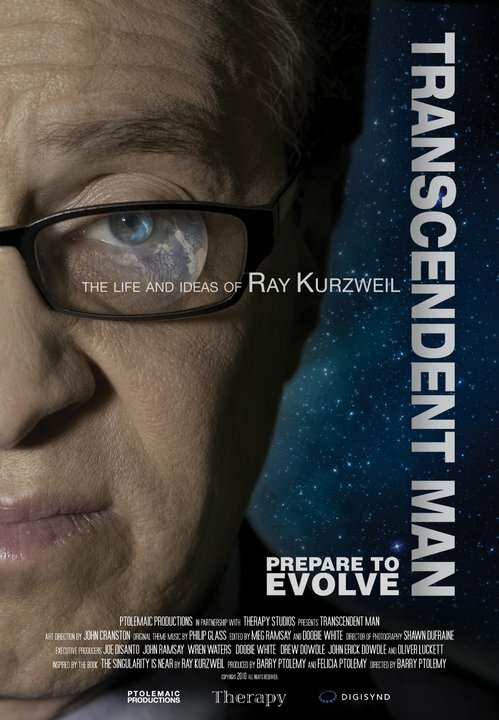 The 2009 documentary film, Transcendent Man, introduces the life and ideas of Ray Kurzweil, the renowned futurist who journeys the world offering his vision of a future where we will merge with our machines, can live forever, and are billions of times more intelligent — all within the next 30 years. A debut documentary from writer/director Barry Ptolemy. Be sure to visit the film's official website for screening times and future release plans. A collection of reviews and film-related announcements can be found in this section. One of the most controversial documentaries of our time has been available for digital download for several months now, yet many in the mainstream are still unacquainted with the ideas, concepts, opportunities and challenges presented by the coming Technological Singularity. 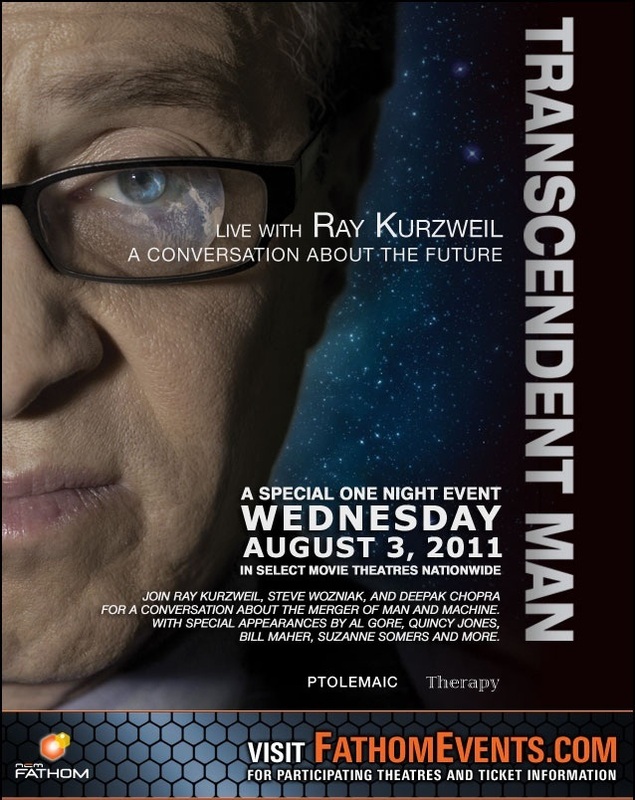 Singularity Hub | Transcendent Man movie blowout August 3 — Ray Kurzweil, Steve Wozniak, Michio Kaku, and many more! The future is coming to the 49 out of 50 of the United States (sorry, Wyoming). On August 3rd, Transcendent Man: A Conversation About the Future will be appearing in 500+ theaters across the country. 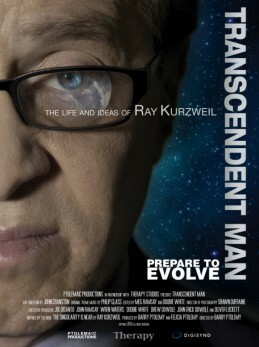 Consider Transcendent Man, the recent documentary about inventor and futurist Ray Kurzweil. The film is based on his 2005 book The Singularity is Near and builds on his past 20 years of accurate predictions of technological growth. This is the reality we forget: technology is constantly getting twice as powerful, half as expensive, and much smaller. 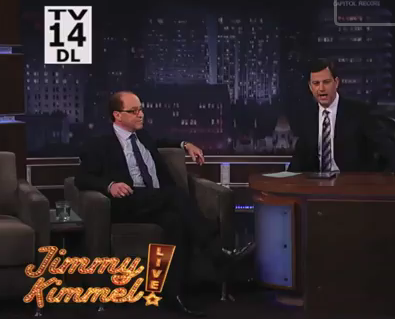 Ray Kurzweil will appear on ABC’s Jimmy Kimmel Live on Thursday, June 16 and HBO’s Real Time with Bill Maher on Friday, June 17 to promote the critically acclaimed documentary film Transcendent Man. Check network links for local show times. Hey folks, Harry here with a new DVD column and things are a bit different this week with some of the titles, and I’m betting that will at least continue with next week’s amazing series of titles. I think you’ll enjoy some of the surprises this week. When will computers attain consciousness and surpass humans? Genius inventor Ray Kurzweil calls this event the Singularity, and he pinpoints it at 2029. In this startling 2009 biodoc, he shares his theories about technology’s exponential acceleration. Kazakhstan Prime Minister Karim Massimov posted in tweeted that he watched Barry Ptolemy’s Transcendent Man. “I saw the film, The Transcendent Man. It changed my vision of the future,” the Prime Minister posted. There are moments in history that shape humanity’s trajectory. Such events vary in form, content and timescale, and the likelihood is that only a few people are ever truly aware of the epistemological, and in some instances geological, ground shifting beneath them. What if we were on the cusp of such a moment right now? Cinetalk Reviews YouTube channel | A review of the documentary about the life and ideas of Ray Kurzweil. Screening details: Transcendent Man will screen at San Francisco’s historic Palace of Fine Arts on April 14, 2011, at 8:00 pm. The screening will feature a special introduction by Ray Kurzweil and post-screening Q&A with director Barry Ptolemy and Ray Kurzweil. How do you get everyone to sit up and pay attention to the idea of the Singularity? Make it entertaining. No doubt about it, Transcendent Man is that and more. Barry Ptolemy’s documentary on Ray Kurzweil explores the philosophy, personal history, and predictions of one of the world’s most prominent futurists. For a very important reason, Transcendent Man begins with death. It’s a theme that pervades the entire discussion of technology, the future, and the direction that humanity might be headed in. After all, it’s that fear of death that propels us forward to delaying it, and, if Ray Kurzweil has his way, defeating it.